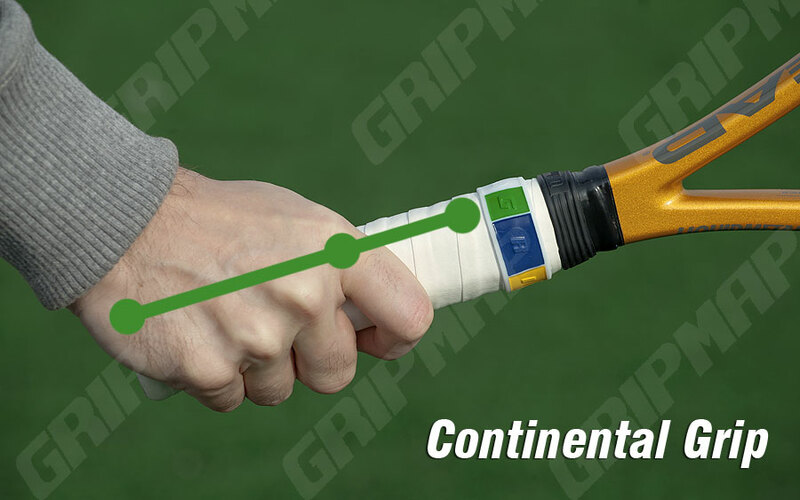 GRIP, the way of holding the tennis racket in order to hit the shots during a match. 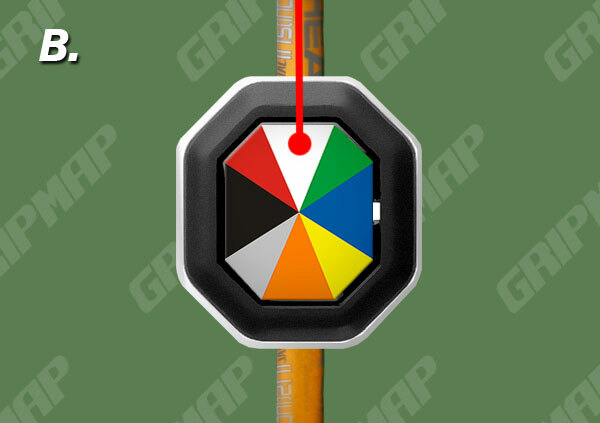 All professional players change grips during a match, depending on what shot they’re attempting. Map, the symbolic depiction highlighting the relationships between the tennis racket’s elements. A rubber ring placed on the upper side of the handler, divided into 8 (eight) rectangular colored sides, one for each of the octagonal handler sides/bevels. 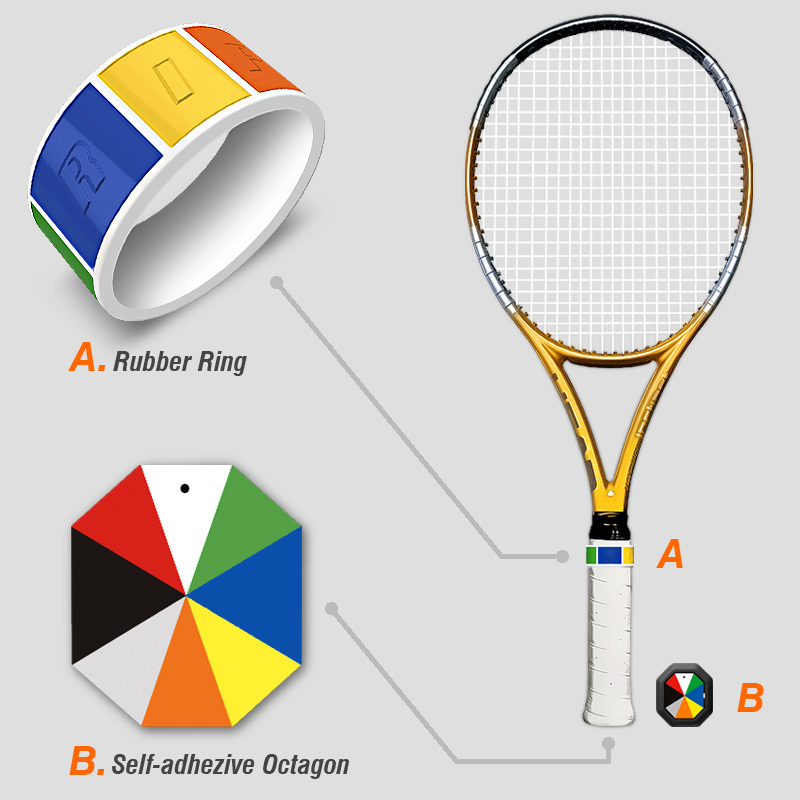 A self-adhesive octagon-shaped piece, divided into 8 (eight) triangular colored sides, one for each of the octagonal handler sides/bevels, placed on the back of the tennis racket handler. 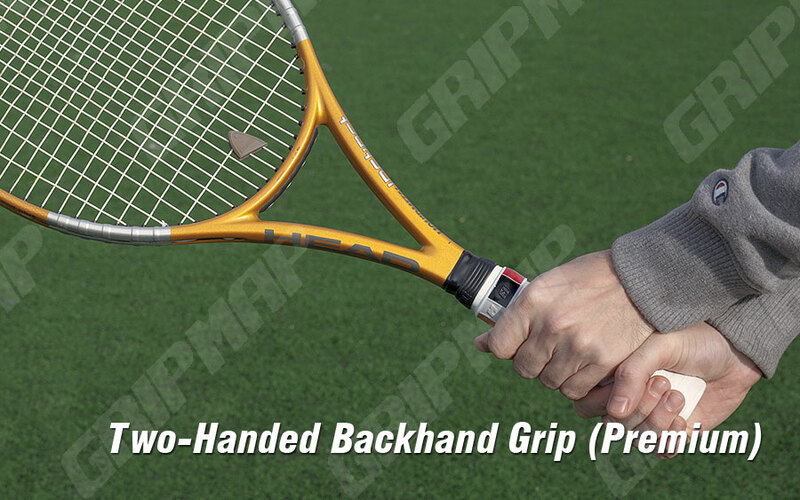 The tennis racket handler has 8 bevels, each indicating a grip, a possible position of holding the racket while playing ? 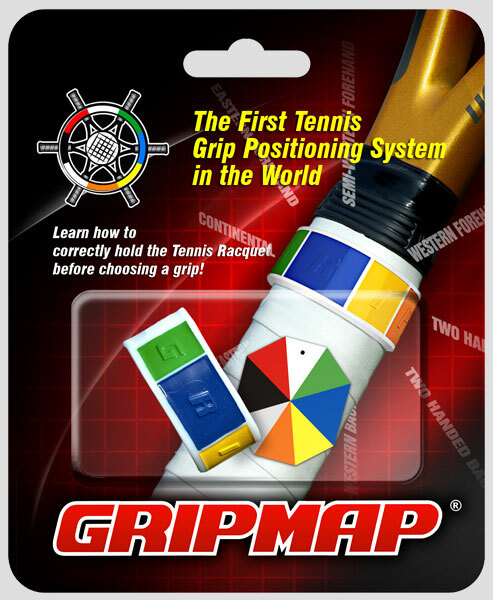 Every professional tennis player might use up to 4 different grips while playing just a single point ? 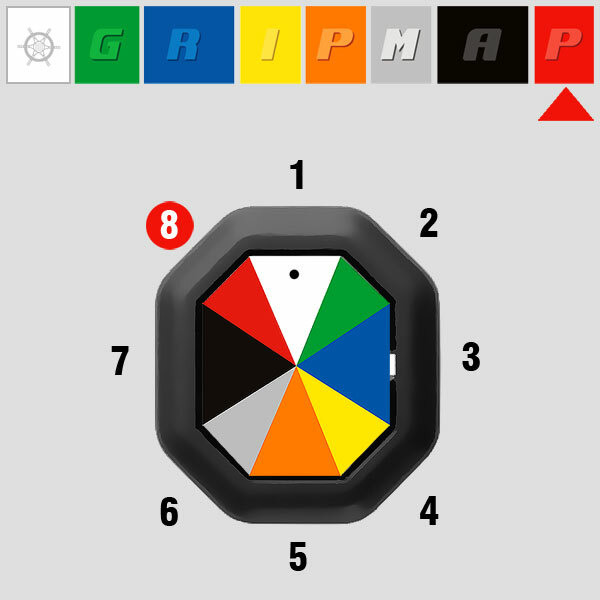 You can super-easily learn, spot and choose all the possible grips combination that bests suites your game ? 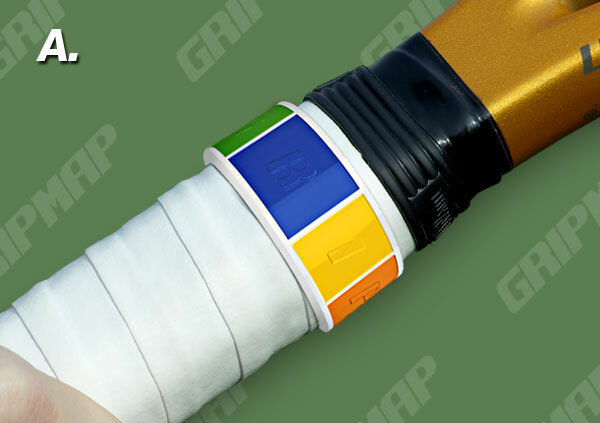 GRIPMAP is the first device invented in over a century of tennis that actually displays all the possible grips out there ? A. 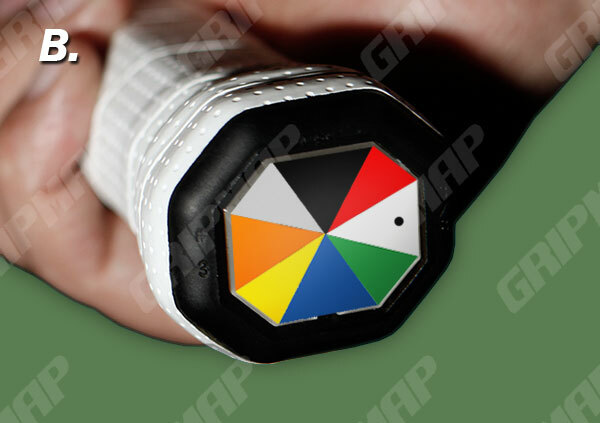 Place the rubber ring on the upper side of the tennis racket as for the white embossed square with the gripmap logo to be perfectly in line with the frame. B. Place the self-adhesive octogon on the tennis racket handler back as for the white triangle to be perfectly in line with the frame. Learn how to correctly hold the tennis racket, before choosing a grip! As all the tennis players and lovers out there are deeply aware of, the fundamental thing to be learned before even thinking of playing the game is the tennis racket position in your hand. AKA the grip! The secret is to position the base knuckle of your index finger on a bevel, and the corresponding base diagonal towards the heel pad on the same bevel. Now, once you are doing this right, you realize that there are 8 bevels on the tennis racket handler, which one to choose? Well, as you can see in the pictures, each bevel stands for a particular grip: Eastern backhand grip, Continental grip, Eastern forehand grip, Semi-western forehand grip, Western forehand grip, two handed backhand, semi western backhand grip. Sims too many? They are, but you do not need all of them. You just have to choose the ones that best suit your goals, game level or aspirations. So, at this point you have reached the next level: learning how many grips are, what each one is used for and how to choose the combination that best fits your style. With exercise, you will learn to keep that diagonal on the same bevel, and the reference will become the base knuckle of your index finger, which you should always position on the bevel indicated by the Gripmap ring colors as the correct one for each particular shot you are attempting. Powerful, swift, fluid and accurate strokes in tennis are the combination of many factors. From how fast you move on the court to how well you stretch your arms and legs. But it all starts and ends with how you hold the tennis racket on your hand: the grip! No matter how much time and money you spend finding that perfect frame made out of cutting edge alloys and using top notch technologies, the most important part of your racket and your game its not the racket per se, it is how you hold it in your hand. Although highly overlooked by amateur players, the grips are the essence of all strokes in tennis. Where you position your hand on the eight sided handler has a paramount impact on every single ball you hit. The grip affects the angle your racket hit the ball, where you make contact with the ball, the pace, the height of the stroke, the spin and finally, the placement of the ball leaving your racket. Before Gripmap was invented, for over a century the players learned (and still do) the grips using same obsolete reference tips: "place your knuckle on one o'clock", "hold the racket as if shaking someone's hand", "take the racket as if it was a frying pan" "make a V out of your thumb and index finger and place it on eleven o clock, or one o'clock or two o'clock" and so one and so forth. Now days having the Gripmap, all of those techniques sounds funny, peculiar and hard to understand. When you are a professional tennis player training for eight ours a day and playing dozens of matches each months, the grip become your nature, despite the primitive way of learning them. But when you are an amateur player wanting either to have fun or stepping up for a pro level, Gripmap is a mind blowing brilliant solution. 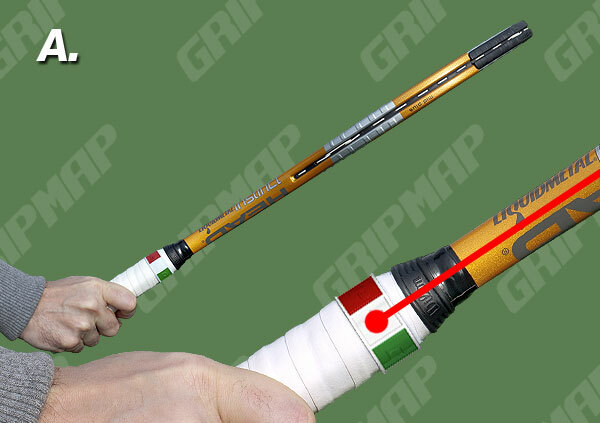 Each grip has its advantages and limitations, which is why professional players change the grip many times during every point, because they want to use the best one for each stroke, and not one for all the strokes. You've all heard about volleys, slices, overheads etc. But basically, breaking down the tennis game, it all resumes to the 3 basic elements of playing: the serve, the forehand and the backhand. Right-handed players - place the rubber ring as instructed and use the Octagon labeled “R”. Left-handed players - place the rubber ring upside down and use the Octagon labeled “L”. 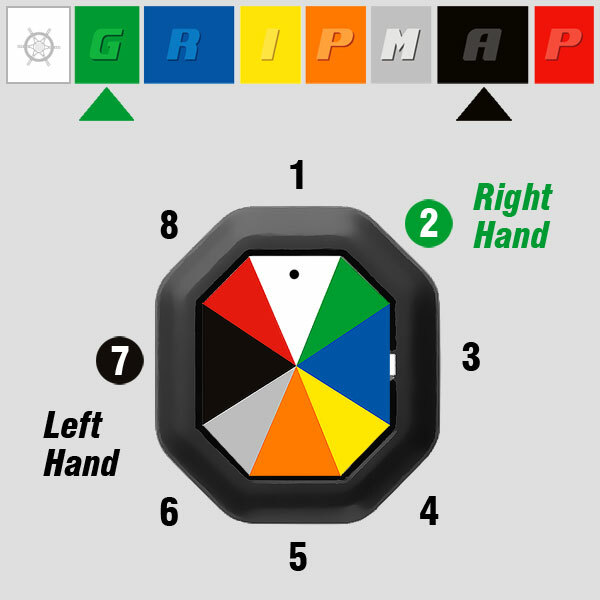 The Grips Guide will help you learn each grip’s purpose, the way to grasp them correctly and which one is best recommended for serve, forehand and backhand. 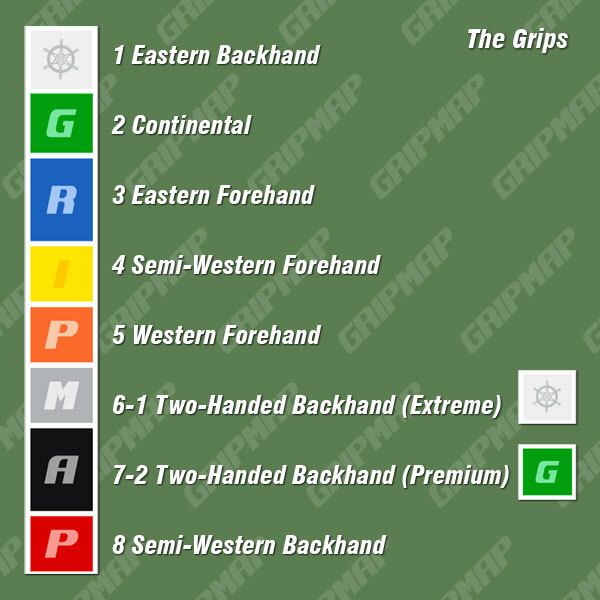 The Grips Guide will help you learn each grip purpose, the way to grasp it correctly and which one is best for serve, forehand and backhand. 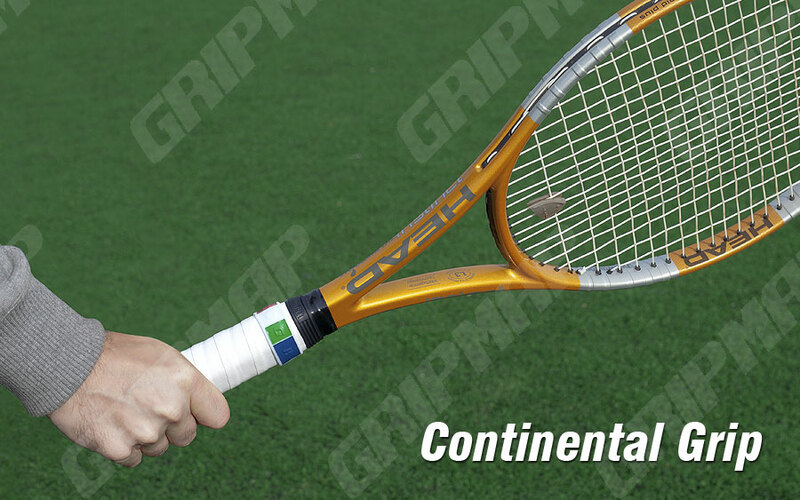 The most famous grip, the Continental Grip is used primarly for serves, volleys, overheads, backhand slices and deffensive shots. 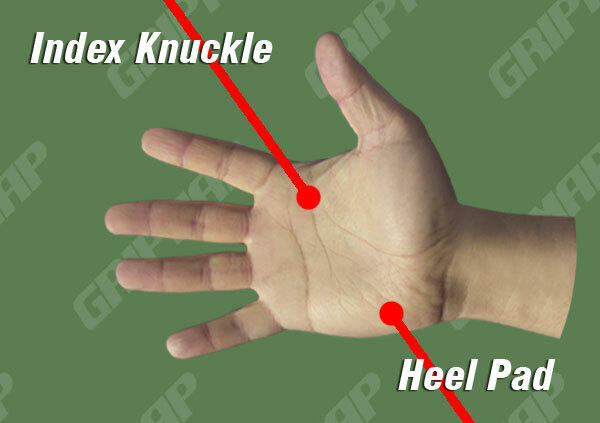 You shall find the Continetntal Grip by placing your index knuckle on the bevel corresponding to the green square of the Gripmap ring. Always make sure the diagonal between the index knucle and heel pad stays on the same bevel. Great for serves, volleys, overheads, backhand slices, defensive shots, handling low balls and wide balls you’re hardly reaching. It is used by all the players in the ATP and WTA tournaments. Not recommended for forehand or backhand shots since it is hard to generate topspin upon the ball and its lack of consistency criples your game. The last famous players using it for forehand or backhand shots where John McEnroe and Stefan Edberg, but now days almost nobody use it for that. The only exception is on Wimbledon (and generaly grass courts) where it can be useful to reach low bounces. ...Hitting with the Continental Grip on the serves and overheads is like a modern tennis standard, as it allows accurate and fluid strokes. By naturally balancing your forearm and wrist, the grip generates an explosive and versatile shot with no stress whatsoever on your arm and shoulders. It is also great for volleys, the slightly "open" racket face being ideal for control and underspin. That angle the racket faces the ground, provided by the grip, is the key in choosing this and any other grip. The more closed the angle, the higher and farther in front of your body the strike zone will be. For low balls, defensive shots and wide balls apparently out of your reach is an excellent choice. But when it comes to forehand and backhand is not anymore. You can only hit flat, or with slice, but is impossible to put topspin on the ball. That translates in the fact that if you hit the ball with power and obviously want to keep it in play, you need to aim the shot just shy above the net level, which you’ll soon find out is quite difficult to achieve, most of your balls crashing into the net, hence the lack of consistency if used for such purposes. The Eastern Backhand grip is the second best choice for serve, particulary for kick or twisted serves and a decent choice for one handed backhand shots. You shall find the Eastern Bachand Grip by placing your index knuckle on the bevel corresponding to the white square of the Gripmap ring. Always make sure the diagonal between the index knucle and heel pad stays on the same bevel. It is a versatile grip that provides fair stability for the wrist. You can serve with a kick, roll the ball for some spin or slice it with clean consistency. While solid for handling low bownces, as the Continental Grip, the Eastern backhand grip is not reccomended for hitting topspin shots. It is difficult to control the balls, and many times a player is forced to slice them back defensively losing any point advantage previously created. 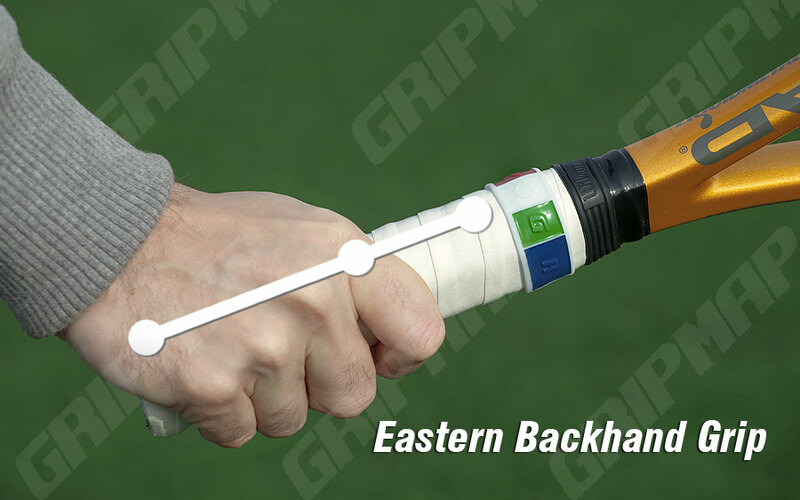 The Eastern Backhand Grip is ocasionaly tried by many professional players. 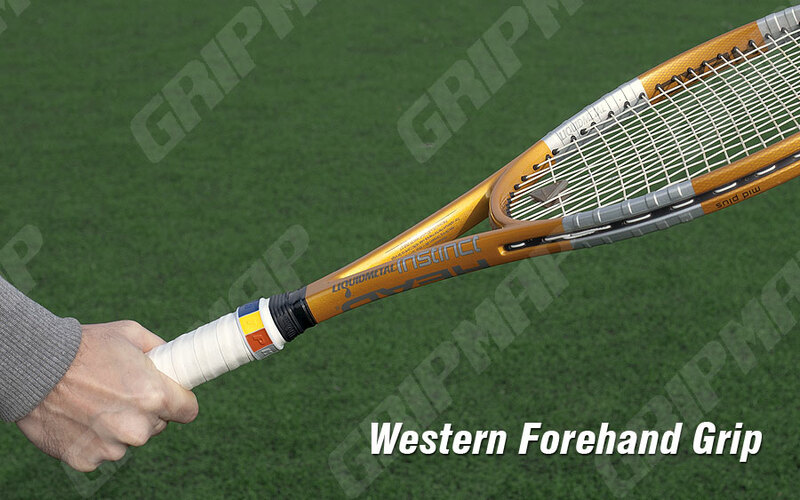 The all-time classic grip for forehand, is the most tought method of holding the tennis racket for beginers. 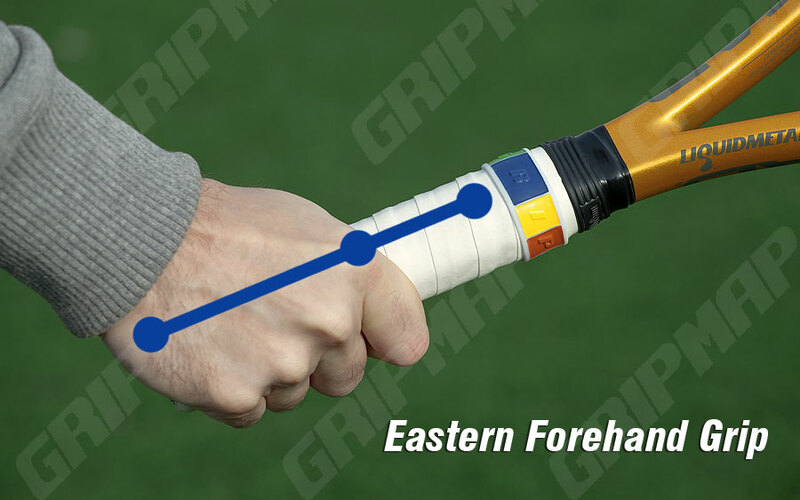 You shall find the Eastern Forehand Grip by placing your index knuckle on the bevel corresponding to the blue square of the Gripmap ring. Always make sure the diagonal between the index knucle and heel pad stays on the same bevel. 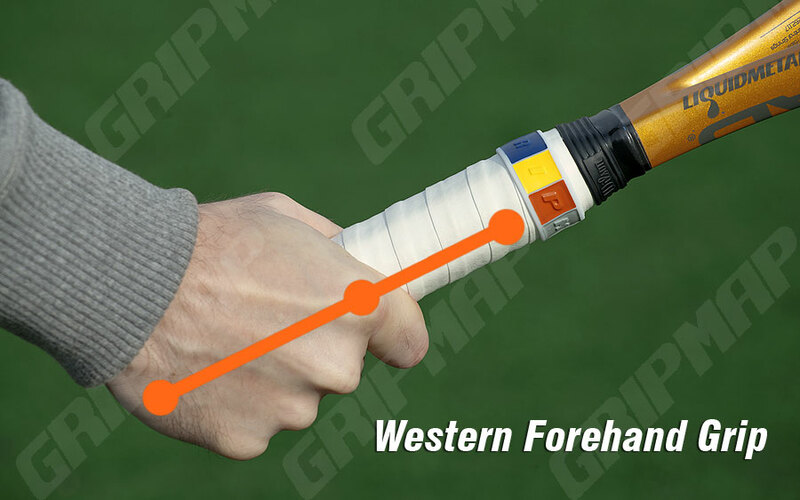 It is the easiest grip for learning forehand, useful for hitting flat balls with no spin, low balls and deffensive shots. It can also be used for voleys and overheads. The most amazing grip in tennis, is by far the best grip for forehand. 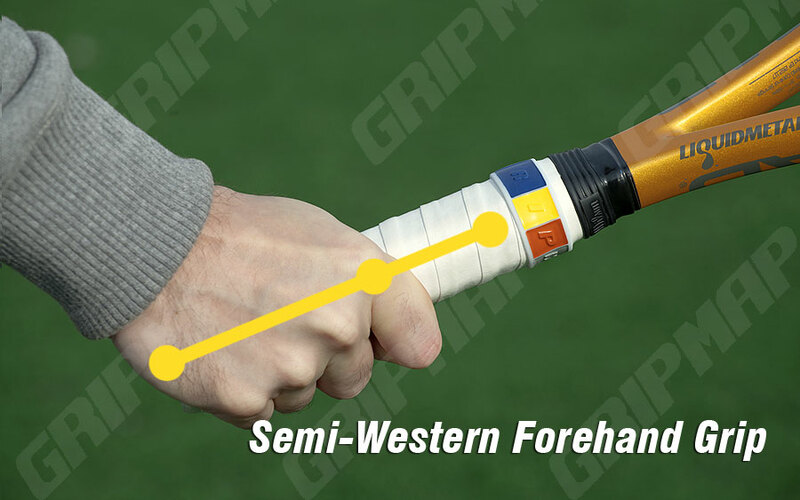 You shall find the Semi-western Forehand Grip by placing your index knuckle on the bevel corresponding to the yellow square of the Gripmap's ring. Always make sure the diagonal between the index knucle and heel pad stays on the same bevel. The best grip to put topsin on the ball. It provides a high and explosive bounce, a heavy topsin that pushes your opponent far behind the baseline. Hard to handle low balls Used by almost every top professional player in ATP and WTA. 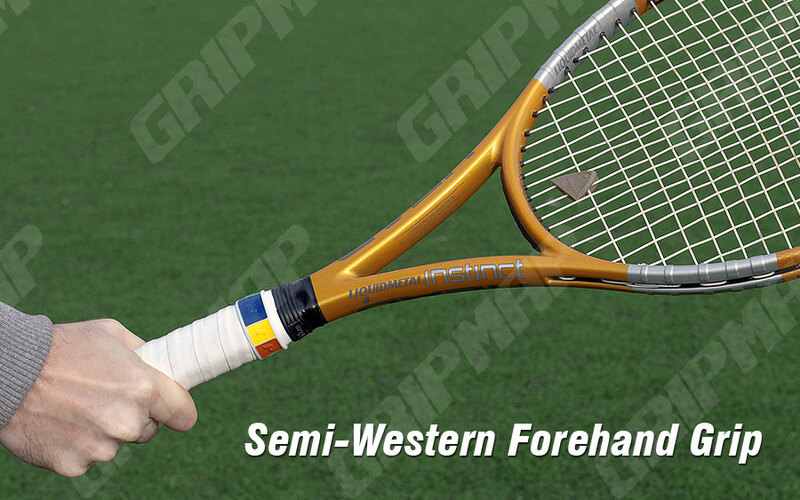 The Semi-Western forehand grip allows a player to put more topspin to the ball than the Eastern forehand grip, giving the shot greater safety and higher control, particulary on lobs and short angles. It also permits a flat drive for a winner or passing shot or taking a bigger swing at the ball since the topspin will help keep it in the court. With a strike zone higher and farther out in front of the body than the Eastern forehand, it's an excellent choice for aggressive players. On the down side, the low balls and volleys are nightmares, that is way you switch the grip to Continental. If you'll keep it for low bounces you can bet you'll hit the net and if you use it for voleyes, you can bet you'll hit anywhere but the court. 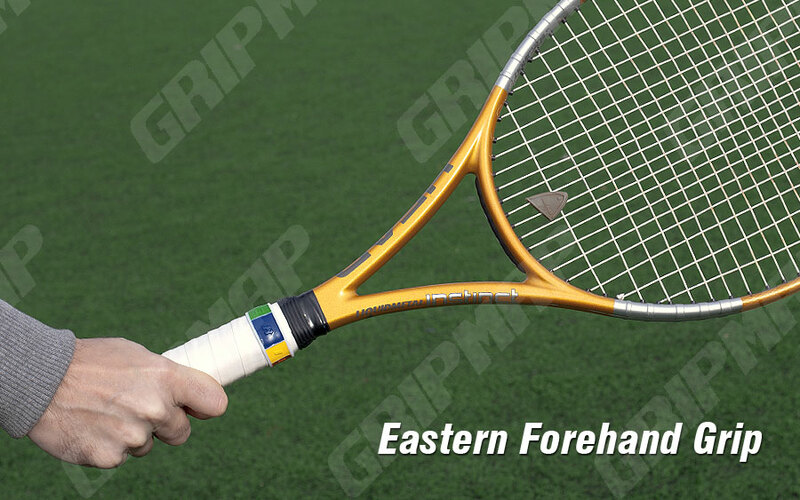 The "extreme" grip of tennis, is the sources of the heaviest forehand topspins. You shall find the Western Forehand Grip by placing your index knuckle on the bevel corresponding to the orange square of the Gripmap ring. Always make sure the diagonal between the index knucle and heel pad stays on the same bevel. Easy to put topsin on the ball and to handle high balls, providing and extra level of explosion on high bounces, keeping your opponent stuck behind the baseline. Hard to handle low balls, hard to hit winners it often chalenges your wrist and speed. Rafael Nadal is the top ambasador of this grip, though several ATP and rarely WTA players are occasionaly attempting it This is an extreme grip that puts a lot of action on the ball, generating extraordinarry topspin. You can hit the ball well above net level and it will still drop into the court. The resulting shot will usually have a higher and explosive bounce, frozing your opponend behind the baseline. The strike zone is higher and farther out in front than all other forehand grips. The ability to handle high balls is its key advantage, but low balls will "kill" you. The speed of your court moves is crucial when playing with this grip, because every second you will be late to a ball, that ball will become a low one, impossible for you to hit with this grip. 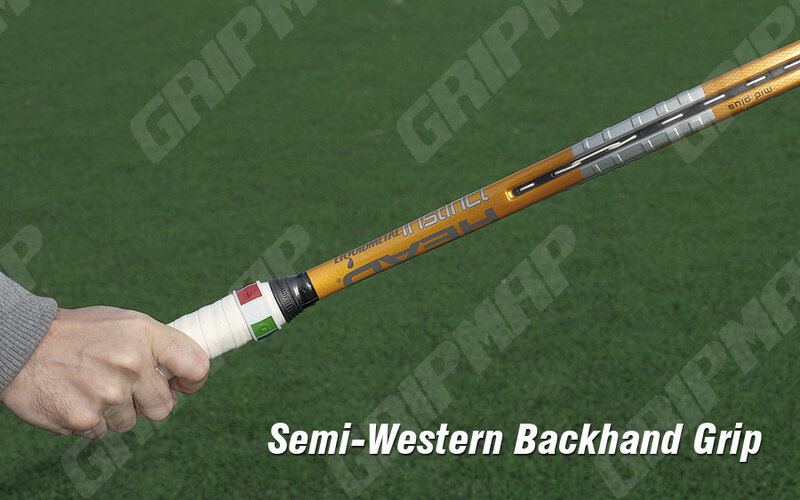 Very popular one handed backhand grip, especialy with clay-court players. 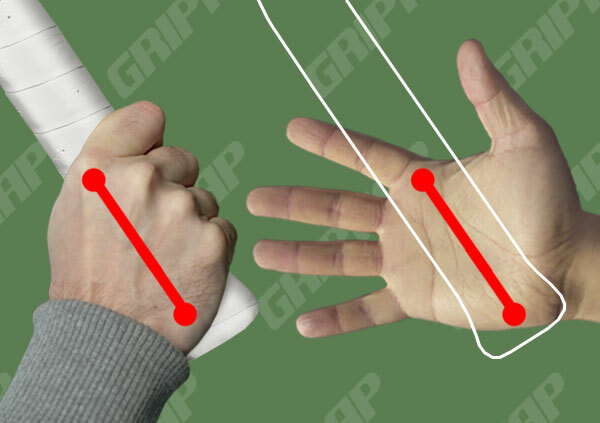 You shall find the Semi-Western Backhand Grip by placing your index knuckle on the bevel corresponding to the red square of the Gripmap ring. Always make sure the diagonal between the index knuckle and heel pad stays on the same bevel. Excellent for high balls, cross hits and topspin. Nightmare on low balls. Players with this grip usually have long, elaborate swings and prefer the baseline. 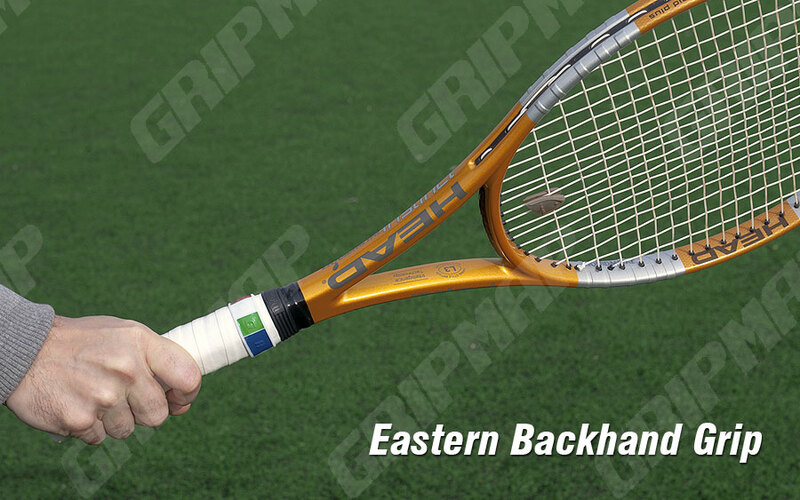 The best backhand grip out there. 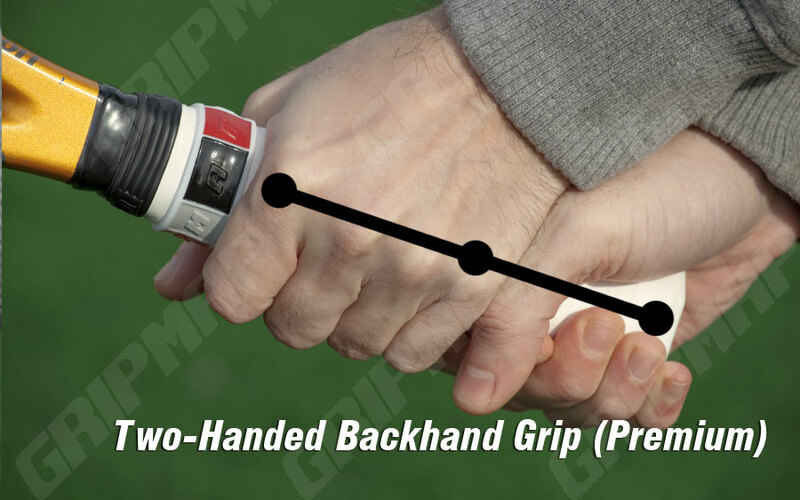 You shall find the Two-Handed Backhand Grip Premium by placing your index knuckle of dominant (Right) hand on the bevel corresponding to the green Continental square of the Gripmap ring and the index knuckle of the other hand (left) on the bevel corresponding to the dark square of the Gripmap ring (as in Eastern forehand bevel for left handed players). Always make sure the diagonal between the index knuckle and heel pad of each hand stays on the same bevel. The choice for players attempting perfect and powerful backhand.A more compact stroke than the one-hander, the two-hander relies on shoulder rotation and an efficient swing to provide that extra power. Extremely effective on the serve returns it also does a good job on low shots. Because both hands are on the racket, the two-hander limits a player's reach. So wide shots can be tough. Also, two-handers can become addicted on topspin, even when a slice is called for, because taking the nondominant hand off the racket to hit the slice or volley is highly difficult making it generally not comfortable at the net. 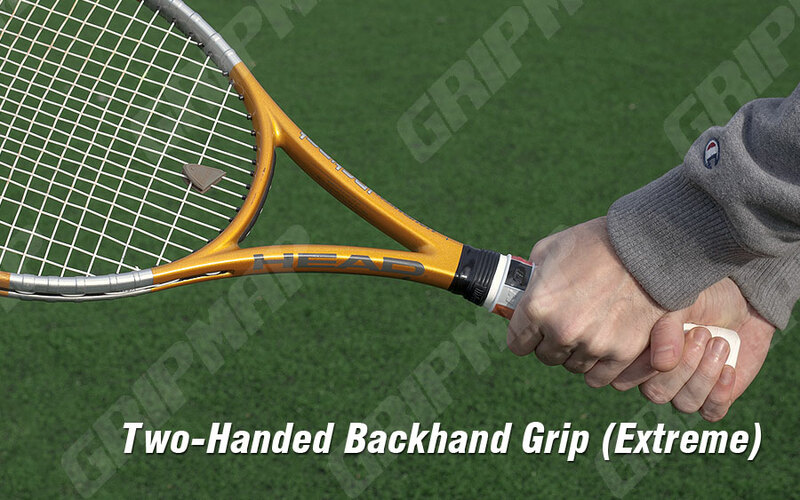 Made famous by Andre Agassi, it is now the prefered grip for many top players, from Rafael Nadal trademark two handed backhand to Novak Djokovic and from Simona Halep to Maria Sharapova. A tricky chioce for two handed backhand players, recommened for those trying to surprise the opponent. 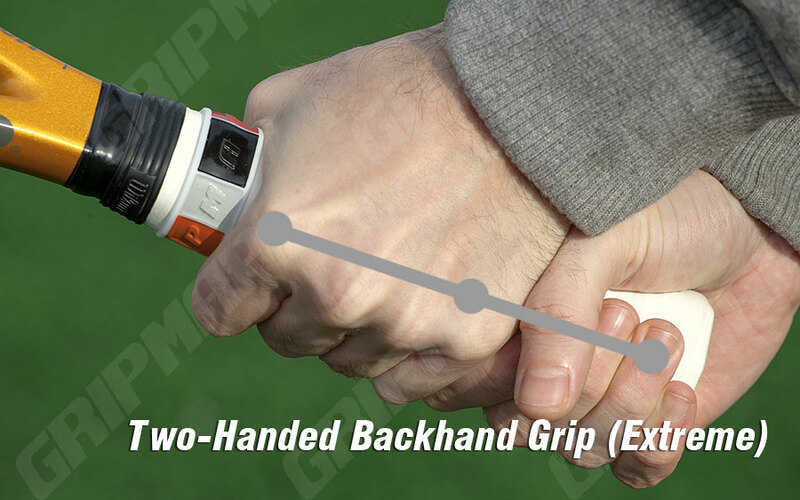 You shall find the Two-Handed Backhand Grip Regular by placing your index knuckle of dominant (Right) hand on the bevel corresponding to the white square of the Gripmap ring and the index knuckle of the other hand (left) on the bevel corresponding to the gray square of the Gripmap ring (as in Eastern forehand bevel for left handed players). Always make sure the diagonal between the index knuckle and heel pad of each hand stays on the same bevel. Imposible to hit low balls, hard to switch to other grips, needs a tremendous effort on the court to reach every ball on its optimal momentum. Use occasionaly by some professional tennis players. Choose the Grip combination that best suits your game and stick to it. You must only need to decide on a color for serve, forehand and backhand and change grip on that color according to your shot attempts. For beginners, the beast way is to use just two grips. The purpose is to learn the tennis game. Basic serve, forehand and backhand elements are to be exercised step by step. Do not jump directly to more performing grips, despite the tempting stars ranking system. As a beginner, you will find it hard to accomplish. So you'll just need to work with two grips, remembering just two colors, switching the grip between them. Being always careful to have your index knuckle on the green square for serve and slice backhand and on blue square for forehand, you will find it as the best grips combination for this stage of your game. The green and blue squares are near by, so is super easy and natural to switch grips in between. Being always careful to have your index knuckle on the white square for serve and backhand and on blue square for forehand, you will find it as the best grip for the next stage of your game. 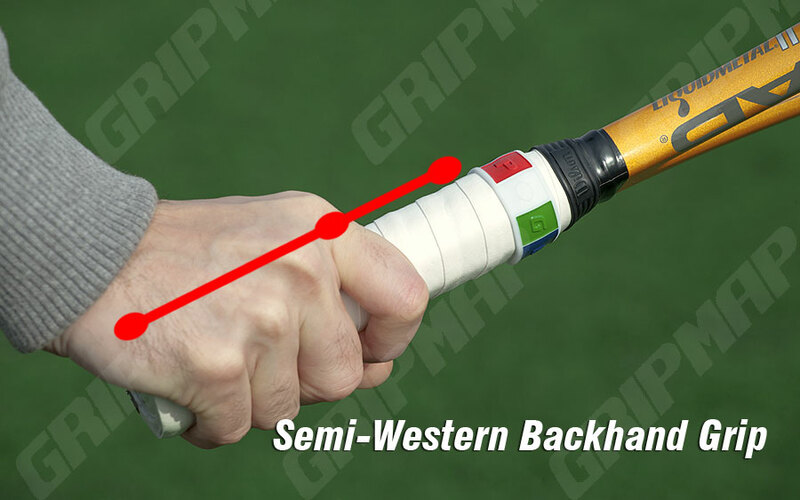 The white square grip will alow you to excersise one hand backhands, not just slice ones. For advanced and professional players the best way of tackling the game is to have a three grips combination. According to your abilities, you must choose the grip combination best suiting your game and not necessary the top ones on the star ranking system! Some grips though having a 5 star ranking are hard to master. So always check the grips before deciding on a combination. 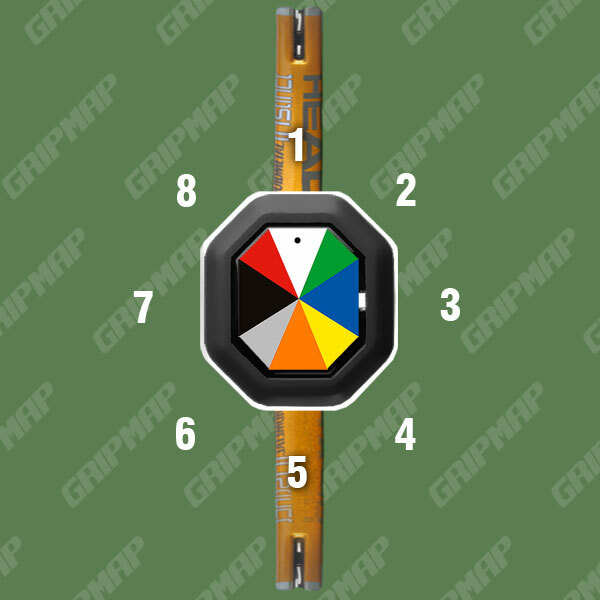 These are the most popular grips combinations. You should always check all the grips and all the grips combination in order to find that one that best suits your natural movements.